Intuitive drag and drop designer with zero coding, fabulous responsive emails made simple. Create beautiful responsive email layouts in minutes. Zero coding required. Dragon 2 does not require internet connection, you can use all features while offline. This is a fully stand-alone software, runs directly from your Mac. Perfect for both beginners and experienced email designers. Jump start with any of our professionally designed email templates, with fluid layouts that renders perfectly on any device. Drag and drop to add beautiful action buttons, fully customizable titles and colors. Perfect for guiding users to take direct actions including clicks, taps and purchases. 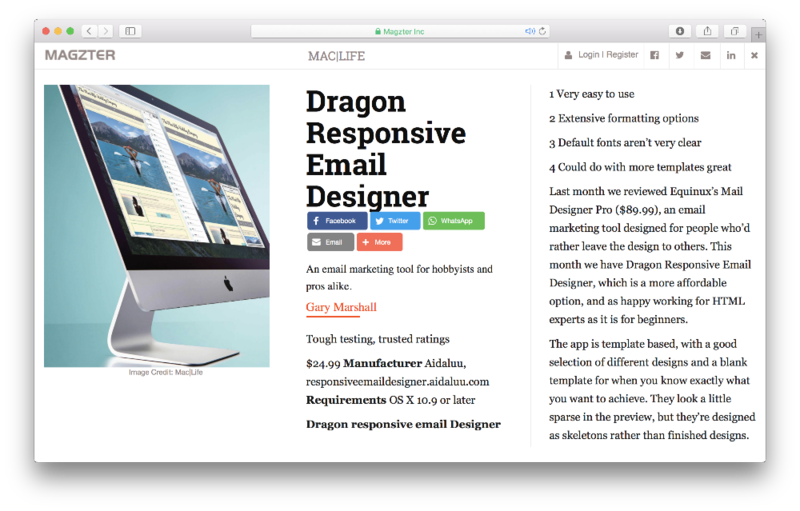 Dragon 2 focuses exclusively on email design. Once your design is complete, you can export to responsive HTML source code format, ready for use with your email distribution tool. Focus on one of the most critical elements in your email design: text style. This app is bundled with beautiful Google web fonts. Use web fonts to increase the consistency of font rendering in your emails. Better presentation = increased effectiveness of your email campaign. Conveniently saves frequently used text segments for quick reuse.